Pulsair’s biodiesel tank blending equipment is the most efficient and effective storage tank mixing process for biofuel blending and agitating. The efficient Pulsair mixing tank process is well suited for the high viscosity and heavy fluid characteristic of biodiesel. Pulsair offers a complete line of off the shelf biodiesel tank blending equipment for 55-gallon drum or larger 250 – 1 million+ gallon tanks for biodiesel fuel storage or production. Pulsair biodiesel tank blending equipment are explosion proof and safe for biodiesel mixing tank. Due to Biodiesel is a flammable product, the fire risks are reduced when using the Pulsair mixing tank process because our mixers do not require electricity at the mixing site. This improves the overall safety of the biodiesel production process and biodiesel fuel storage tank mixing and agitation. Unlike conventional compressed air driven propeller mixers that require constant compressed air flow, the Pulsair biodiesel fuel mixing process involves mixing the entire contents in a few short pulse cycles. The biodiesel fuel gains kinetic energy as it moves throughout the tank. This energy will continue to mix the biodiesel after the Pulsair system has shut down. This pulsing process takes advantage of this phenomenon as tanks can often be mixed with an on/off cycle that reduces energy usage by 50% while achieving the same results within the same time period. Our biodiesel fuel mixing equipment is designed to meet the unique mixing requirements of our biodiesel customers regardless of their tank size. With multiple biodiesel storage tanks, Pulsair can cycle from one tank to the next, allowing the liquid momentum to continue to mix one while the next biodiesel tank is being pulsed. Experts have recently learned that biodiesel properties can change when the biodiesel is cooled and then reheated prior to use. This cooling and reheating has compromised the promised benefits of biodiesel as cooled and reheated biodiesel does not perform as well in engines as does biodiesel that has maintained a constant temperature after the biodiesel has been produced. The Pulsair mixing process can efficiently create immediate vertical biodiesel mixing at any fluid level in the tank. This helps allow operators who have installed heating coils to achieve uniform temperature distribution in their biodiesel storage tanks faster using less energy. The Pulsair biodiesel fuel storage tank mixing process works by sequentially injecting compressed air or gas into the bottom of a tank or vessel filled with fuel. 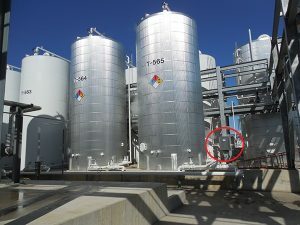 Large air bubblers are released on the underside of accumulator plates that are attached or located at the tank bottom. The Pulsair controller regulates the amount of air, pressure and timing, depending on the type of material, viscosity, and temperature requirements. The rising bubble displaces liquids as it rises to the surface while also pulling heavier bottom liquids up resulting in a homogenized biodiesel fuel blend. Timed air pulses create immediate vertical flow patterns mixing materials of different oil viscosities from the top to bottom. This powerful yet efficient mixing process involves the entire contents of the tank and can operate at any liquid level. The Pulsair mixing process is more efficient than mechanical mixers, mixes faster and requires zero in-tank maintenance. Benefits of Pulsair’s biodiesel blend tank Systems? IBC (intermediate bulk containers) – plastic, steel, stainless steel, etc. Pulsair Systems manufactures and supplies fast, energy efficient and low maintenance mixing solutions for lubricant and fuel blending.